AOT is a big part of using Angular. I’ve used Angular CLI successfully here at ag-Grid to build applications with AOT and found it very easy to use, but sometimes you need more control and fine tuning, and sometimes you just need an alternative, so in this blog I go through how to use ngtools/webpack, as well as describing the benefits in generally of using Webpack & AOT. 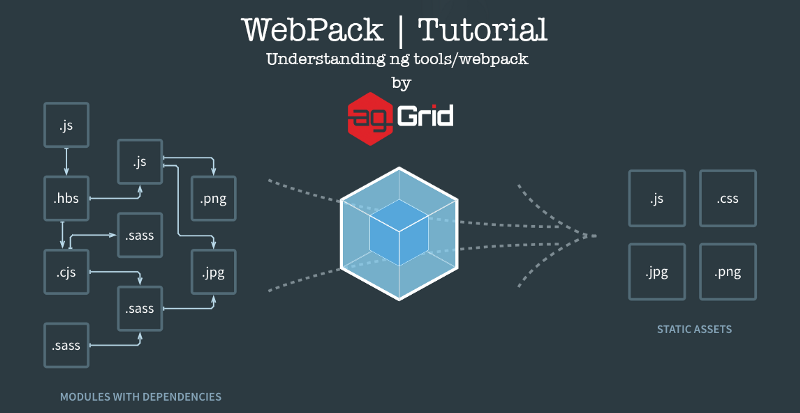 Webpack is a module bundler but through the use of loaders and plugins we can get it to do far more, including transpiling TypeScript, processing CSS & images and now, with the inclusion of ngtools/webpack we can get it to transpile our code to make it AOT ready, all within our Webpack configuration. All code for the blog can be found at the Webpack Tutorial: Using ngTools/webpack repository on GitHub. In order to focus on the build side of things our application is deliberately simple. All the file sizes and load times are small given our applications simplicity, so it’s worth noting the relative differences in size and load times, not the absolute values. As you can see there’s not much to our application — no CSS or images and very little logic. This is deliberate so we can concentrate on the changes in application logic size and loaa times, which is what AOT really brings to the table. Not much to say about this configuration — pretty standard setup here. Note we’re excluding app/boot-aot.ts - more on that later. Exciting! But the output of the application isn’t what we’re interested here — we’re interested in network traffic and load times. Let’s look at that next. JIT (Just-In-Time) Configuration: I'll describe this briefly as well as the results of using it. Non-AOT Production Configuration: A Production ready configuration, but without AOT support. AOT Production Configuration: A Production ready configuration, this time with AOT support. The bulk of the blog will focus on the latter two configurations — how they compare and how they’re used. ['awesome-typescript-loader', 'angular2-template-loader']: Transpile and process our Angular code. html-loader: Take the results of our Webpack configuration and inject them into a pre-supplied html file. 10.7MB and 1.06s to load — big, but not surprising given we’re not compressing anything and we’ve not minified anything so far. Let’s use this as a baseline — we won’t make any further changes to this configuration — it’ll do for development purposes. 1.3MB and 686ms to load. With very little configuration we’ve got a pretty respectable build config working here. There is obviously one part we’re missing in our Angular application. We’re including the Angular Compiler as part of our application and are compiling our Components at runtime. Let's do something about this and see what it gets us next. In this bootstrap file we no longer dynamically compile our module and components, but rather use the pre-compiled factory to do it for us. This will mean much faster load times. The plugin makes use of our AOT friendly tsconfig and additionally points to the application entry point — in this case our main Application Module (app.module.ts). 951kb and 549ms to load. What a huge improvement in file size — thats almost all due to us no longer including the Angular Compiler in our application anymore. The load time is improved too, and that’s due to our components being pre-compiled — the compilation step has been pushed to build time, which is where it belongs for production deployments. Still simple, we just have a few more components this time around. 1.3MB and 734ms to load. The increased load time would be down to Angular needing to compile there (admittedly simple) components at runtime. 989kb and 535ms to load. Same size and even quicker (although that’s just lucky — if we ran it again it might be slower next time around)!. Although all these values are small, especially the load times, you can hopefully see how these improvements would be magnified in a real-world application with many complex components. For very little effort you gain all the benefits of AOT while still being able to leverage the flexibility that Webpack offers. I can’t see a good reason why you woudln’t use the two together! Although the file sizes should be pretty consistent if you run this code, the load times can vary dramatically depending on your machine configuration and what the load on your machine is at the time. It’s probably worth looking at the load times on average in a real-world application, rather than a particular page load to get an idea of the real benefits on offer with AOT. That’s a pretty decent improvement by the inclusion of a single plugin — and thats with relatively simple components. If you scale up to a full application with many components and for example lazy loading, the improvement you would see would be even greater.